About 180 Years in America. So, that was the start of the Wilson's, Herting's & Lezak's in Brooklyn. The first Wilson's were down on Bridge Street in the Walabout area. That was about 1830 After a while they migrated to Bedford-Stuyvesant. Grandpa Wilson had the candy store and grandma Wilson pushed out sixteen children. No wonder she passed on in 1920 when her husband lasted until 1936. A few of the children died young but seven went on to start their own families. 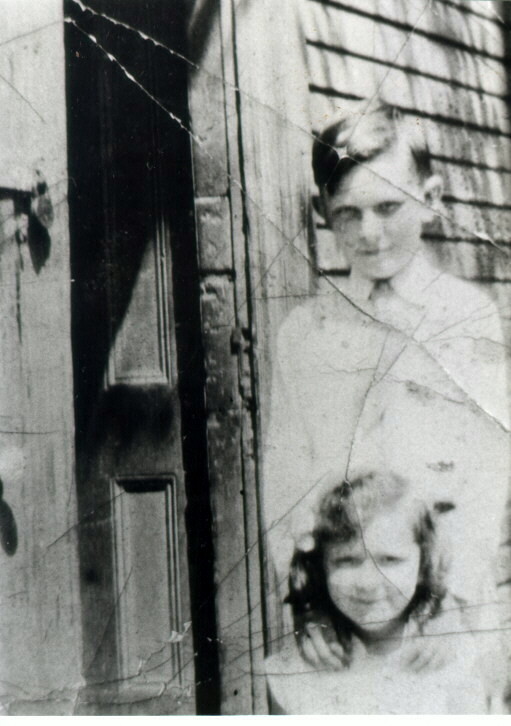 My Pop & Mom were Harry Wilson and May Stephenson Wilson (left).
! Harry is interred at Evergreen cemetery with his wife in the Mount of Olives Section. His last address was 876 Herkimer Street.He worked for Lieb and Buchalter (a plumbing supply company), as a driver/warehouseman.He died at St Johns Hospital in Brooklyn and the funeral home was Benjaman Grinrod. According to the draft registration, Harry was born on Aug 19, 1896 and was employed at that time by D. Stryker Express Company at 49 Sumpter. He had grey eyes and brown hair, medium height and build. 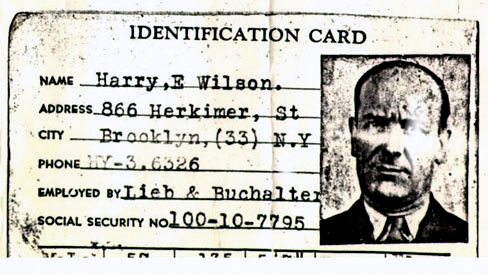 He is also listed in the 1933/34 Brooklyn directory as a salesman and living with his family at 1882 Fulton. Harry was very good with his hands and could do most anything from plumbing to repairing televisions. In the 1925 census Harry was 28, a chaufeur and married to May,26 and living with Harry 5 and Lillian 77 days. 1930 census on file. 1918 declared eligible for service and lived at 1845 Fulton Street. May's grandfather (Milburn Stephenson) came from England about 1865. His wife had died giving birth to their second son. May's entire line lived at 876 Herkimer at one time or another.! May had various spellings of her name including: Mae and Mary. The Middle initial "E" is thought to be Elizabeth. The actual spelling is M-A-Y as is indicated in all documents that bear her signature. She is listed in the 1933/34 directory as living with her husband and family at 1882 Fulton. She is listed in the 1915 State Census living with her parents and her brother William. It says that she is 16 and a factory hand. Here is my Pop's I.D. when he worked for Lieb and Buchalter Plumbing. By the way, May's brother also worked there and her father was a Plumber but I don't know if he worked there or not. Here to your left is my brother Jimmy and my sister Lilly Wilson Davis. Both were older than I. She passed away Dec 1, 2004. And let's not forget me (Skippy Wilson). 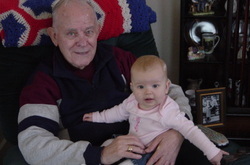 This is my great grand-daughter Alyssa Dunn.